Hello everyone. I just bought my first Luv. It's an '81 diesel 4x4. I'm trying to go through it. It spent it's life as a farm vehicle. I'm trying to learn as much as I can along the way. My grandfather had a late 70s 2wd gas Luv when I was a kid, but other than that, I've never had any exposure to them. I was just looking for a small truck to knock around in and came across this one. I had no idea that they made diesels or 4x4s in Luv trucks. As soon as I saw it, I knew I had to have it. Now I'm hooked. I want to go ahead and thank everyone for the things I've already learned from your posts. I look forward to getting her back into top shape. Welcome. No one tell you about the pictures rule? LUV to see them. I hope you have lots of patience when you start on the front drive. Welcome to the site! What part of GA are you in? There are a few maintenance items you should take care of before driving this truck. Replace the timing belt. It is an interference engine, so if the timing belt breaks, you will need replacement rocker arms and pushrods. Those are hard to find. Replace the oil line that runs from the block to the back of the alternator. This lubricates the vacuum pump, but if it breaks, you will lose your oil in a hurry. The rubber inside gets quite brittle with age, but on the outside it looks fine. I know of only one source for that part, so send me a PM if you need his email address. Drain and refill the transmission/transfer case. It requires motor oil, but they often get filled with gear lube. Gear lube will cause transmission failure. Thank you very much for the tips Jack. I was kind of wondering where to start. ( Besides the obvious safety necessities like brakes and tires). To everyone else: Hello, and I will try to get some pictures up soon. I'm in central Georgia, south of Atlanta in Turin. It's in the Newnan, Peachtree City, and Griffin area. We are next to Senoia which used to be a nice little town before "The Walking Dead" happened. You had me wondering if you were coming back here. Holler if you need help finding parts. Some of my family came from the Newman / Coweta County area. I don't know which of the pictures you're able to see, but they are all of my '81 Luv except for the two with grey interior. 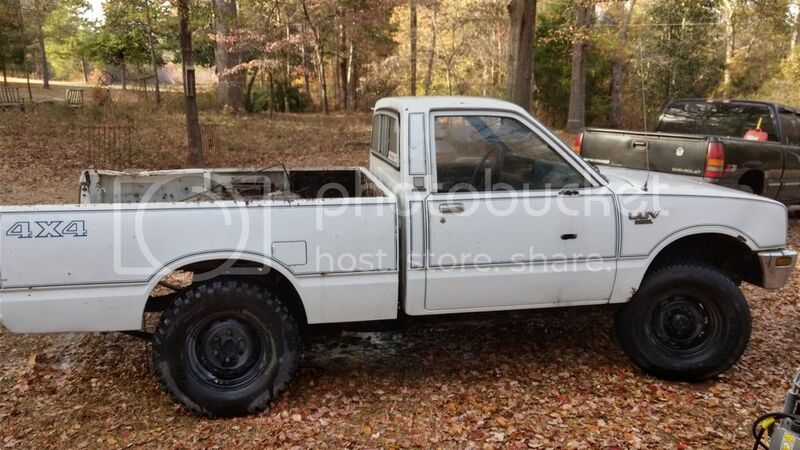 That is a Mazda B2000 which I took the seats from to add to my truck. In hindsight, they were not the best choice. They took much more modification than I was expecting, but I did insist on using the factory mounting points, and I like the way they look. I will try to get some of the interior pictures put up. I welcome any comments (good or bad). I know very little about these trucks and could easily miss obvious things that are wrong/not original etc. I'm not looking to do a perfect restoration, but I would like to keep/return it to mostly stock. I'm doing safety/obvious mechanical first, then routine/improvement mechanical, and finally interior/paint and body/looks. The only reason that I already did the seats is that the others were so bad I basically considered them a safety item. Thanks in advance, and I will try to start another thread or find an appropriate place to post updates instead of posting them in the intro area from now on. Prepare to spend days of searching the inter web. Keep searching craigslist. Looks like a new bed is a must. I only see one photo, of the right side. Try attaching your photos instead of using photobucket. Then you won't need the IMG or URL tags at all. Hopefully, that worked a little better.